Organised crime gangs are using social media and a physical presence in Hong Kong's public spaces to coerce domestic helpers to engage in money laundering and drug smuggling, the Sunday Morning Post has learned. Victoria Park - a popular recreational area among the city's more than 300,000 domestic workers - is just one of many public areas where criminals attempt to spark friendships with helpers with a view to using them later for illegal acts. Hong Kong's migrant workers - most of whom hail from rural villages in the Philippines or Indonesia - are considered among the most vulnerable members of society and criminals prey on their trusting, sometimes naive, mindset, according to Sringatin, chairwoman of the Indonesian Migrant Workers Union. Last year, the Post reported that Hong Kong triads were using migrant workers to smuggle drugs across the region, something Sringatin said had been happening for a "long, long time". In December, a 29-year-old Filipino domestic helper was arrested at Chek Lap Kok airport for allegedly trying to smuggle more than 2kg of cocaine into the city. She faces up to 26 years in jail if found guilty of trafficking. Benny Mamoto, deputy chief inspector at Indonesia's National Narcotics Agency (BNN), said international drug traffickers, often in the guise of tourists or expatriates, targeted the helpers in large, public congregations. 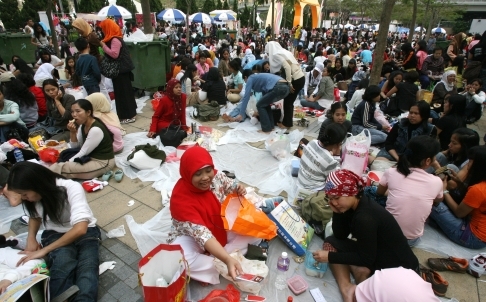 "Recruitment is common in Victoria Park, Hong Kong, as it is the central gathering of women workers," Mamoto told Indonesian media last month. The recruiters at first appear friendly, treating the women to meals and hinting at the possibility of a relationship, said both Sringatin and Mamoto. They later request favours from the women, such as opening bank accounts or transporting luggage, which invariably contains drugs or other illicit items. The helpers, Mamoto says, are typically tricked or coerced into such actions. On Wednesday, a 25-year-old Indonesian domestic helper was cleared of wrongdoing in a money laundering case after she set up a bank account at the behest of a man she met in a park in Yuen Long. The account was used to wash HK$340,000 of suspect transactions, but the helper was found not guilty because she had no idea about the purpose of the account, Sringatin said. "These men abuse the emotions of the migrant workers by telling them 'I like you' or 'I will marry you'," Sringatin said. The maids wanted to change their lives and were easily taken in by such ploys, she added. Crime syndicates are also increasingly using social media and mobile applications such as WhatsApp to recruit domestic helpers. Again, the recruiters purport to seek a romantic relationship, before ensnaring the women in illegal schemes. According to BNN statistics, about 36 per cent of drug-trafficking suspects in Indonesia admit to meeting their overseas recruiters through social-media sites like Facebook. "[Many workers] think they can trust people they meet on social media without knowing their background," Sringatin said. "This is very dangerous."